MOMMY BLOG EXPERT: 5th Chanukah Candle Tonight, Follows a Daytime Party for the Special Kids of The Friendship Circle L.A.
5th Chanukah Candle Tonight, Follows a Daytime Party for the Special Kids of The Friendship Circle L.A.
We've already lit Candle #5 this evening, but still wanted share some of the fun we had last night and today in our continuing celebration of Hanukkah. The first days of the holiday this year have been so busy -- and we had a very full schedule of parties over the next days -- so we decided to make last night's Hanukkah celebration a quiet, stay-at-home family affair. The highlight Saturday night at our house -- besides the menorah lighting, of course -- was another sleepover by Dexter the Miniature Pinscher who has begun to make more frequent appearances on this blog ever since he made his debut on MommyBlogExpert wearing Snug As A Bug's Red Doggie Pajamas. Last night my kids gave our favorite little canine a Chanukah present: a completely reversible Gold Lame & Leopard Dog Coat from Zack & Zoey. When they put this on him one of my girls said, "Doesn't this little four-legged guy look kind of like Michael Jackson?" I am so proud to say that my 13 year-old son who has served as a volunteer for FCLA's Kung Fu group for several years, also helped out at Sunday's party. His triplet sister decided to come along to the celebration too, and was so moved to action that she signed up today to start donating her time to work with the group's very young special kids. The party itself, which was free to all, was among one of the most inspirational holiday events I've ever attended. In such a small space in just a few hours there was so much going on: activities that would appeal to every age group from toddlers to teens. The best part was that it appeared as if the teen volunteers out numbered the kids who directly benefit from FCLA's community services so there was a lot of one-on-one going on here this afternoon. If you are wondering, yes it DID snow in Los Angeles today in FCLA's backyard thanks to the "snow" that was produced by Arctic Glacier on site. As the kids watched, huge blocks of ice weighing hundreds of pounds moved down a conveyor belt and were magically transformed into snow flying out of an over-sized hose. As if that wasn't enough, while this was going on outside, the talented artists Victor and Antonio from Crystal Creations were at work in the main party room carving a kosher menorah over 5 feet high from a gigantic piece of ice as party-goers watched. FCLA Director Rabbi Michy, guitar in hand, along with some of the teens from the L.A. Jewish Homeschooler's Band, entertained as the organization's kids joined in a lively sing-along. 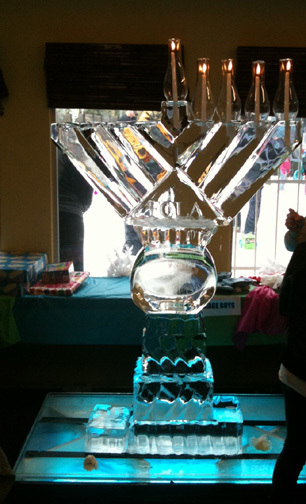 Then everyone enjoyed the lighting of the menorah with real candles placed in holders atop the crystal-like ice sculpture, followed by presents which were distributed to all FCLA's children. This party, for sure, was amazing on many different levels. Multiple craft tables ran simultaneously -- all staffed with teen volunteers -- with special needs kids of every age making everything from marshmallow menorahs to faux stained glass dreidel windows. In keeping with the icy theme refreshments included hot chocolate for kids and cappuccino for caffeine-dependent adults like me. There was even a separate room overflowing with what seemed like an endless amount of food ranging from hundreds of potato latkes with applesauce and sour cream to many dozens of jelly and custard doughnuts with "The Friendship Circle" hand-stenciled by volunteers on many of them. What Didn't FCLA Think of When Planning This Party? Seeing so many thoughtful teenagers working with these children in need -- all enjoying a fun-filled day of Hanukkah festivities together -- was truly heart-warming and a vision that I'm certain I will carry in my mind for the rest of my life. Please leave a comment: Tell what you think of the FCLA party post or alternately, feel free to share what you have been doing for Chanukah with your kids.